The Abu Garcia BCX Baitcast Reel delivers the cranking power and toughness needed to handle big stubborn fish such as catfish or northern pike. Abu Garcia's reliable BCX Baitcast Reel features three smooth-performing stainless steel ball bearings and quiet Corrotech-treated Instant Anti-Reverse bearing for durability and to hold firm against bullish fish. 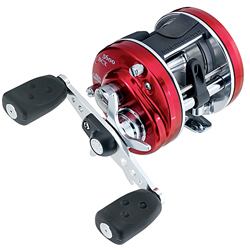 In addition to centrifugal brakes, star drag and comfortable oversized handle, the BCX Baitcast Reel is outfitted with Abu Garcia's innovative Anti-Distortion Spool, which won't torque under a heavy load. "This reel was ok played with it made it better. I use it on a 6ft rod for spinner baits and swim baits. It used to cast light stuff by playing with the settings.After oiling it up with abu oil now it cant cast light things. The reel is good for castng heavy things 1oz.."
"I own two of these and they are awesome for casting. i use mine for simple fish like bonita and shovel nose sharks and have never ever had a problem. the only thing i whould change on the reel is to take out the brakes to let it cast farther." "I use this reel on a 10' cat rod with a 3 oz. egg sinker and cast shad sides at least 300 yrds. once i forgot to hit the releace button before attempting to cast and it actually broke my 40 lbs. line." "Its a nice reel that will cast a mile and has the power to crank in the big ones"